In the world of cons...Eddie's a pro. 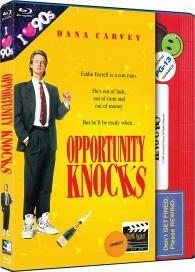 Dana Carvey stars in this comic romp about a down-on-his-luck con man who stumbles onto the greatest scam of his career. On the run from an angry gangster, small-time con artist Eddie Farrell (Carvey) and his bumbling partner Lou break into a luxurious suburban Chicago home. When the owner's parents, Milt and Mona, mistake him for the house sitter, Eddie quickly scrambles and ends up impersonating an Ivy League financial whiz. Soon he finds himself Vice President at Milt's company and wooing his beautiful daughter (Julia Campbell, Bounce). But there is one hitch in this con that Eddie didn't bank on: falling in love.